Maineâs invasion came early this year. In recent hotbeds of tick activity â" from Scarborough to Belfast and Brewer â" people say they spotted the eight-legged arachnid before spring. They noticed the ticks â" which look like moving poppyseeds â" encroaching on roads, beaches, playgrounds, cemeteries and library floors. They saw them clinging to dogs, birds and squirrels. Maine is home to 15 tick species but only one public-health menace: the blacklegged tick â" called the âdeerâ tick â" a carrier of Lyme and other debilitating diseases. For 30 years, an army of deer ticks has advance d from the stateâs southwest corner some 350 miles to the Canadian border, infesting towns such as Houlton, Limestone and Presque Isle. âItâs horrifying,â says Dora Anne Mills, director of the Center for Excellence in Health Innovation at the University of New England in Portland. Mills, 58, says she never saw deer ticks in her native state until 2000. The ticks have brought a surge of Lyme disease in Maine over two decades, boosting reported cases from 71 in 2000 to 1,487 in 2016 â" a twentyfold increase, the latest federal data show. Today, Maine leads the nation in per-capita Lyme incidence, topping hot spots like Connecticut, New Jersey and Wisconsin. Deer-tick illnesses such as anaplasmosis and babesiosis â" a bacterial infection and a parasitic disease similar to malaria, respectively â" are following a similar trajectory. The explosion of disease correlates with a warming climate in Maine, where, over the past three decades, summers generally h ave grown hotter and longer and winters milder and shorter. Itâs one strand in an ominous tapestry: Across the United States, tick- and mosquito-borne diseases, some potentially lethal, are emerging in places and volumes not previously seen. Climate change almost certainly is to blame, according to a 2016 report by 13 federal agencies that warned of intensifying heat, storms, air pollution and infectious diseases. Last year, a coalition of 24 academic and government groups tried to track climate-related health hazards worldwide. It found them âfar worse than previously understood,â jeopardizing half a century of public-health gains. Yet in Maine, Gov. Paul LePage â" a conservative Republican who has questioned global-warming science â" wonât acknowledge the phenomenon. His administration has suppressed state plans and vet oed legislation aimed at limiting the damage. Former government officials say state employees, including those at the Maine Center for Disease Control and Prevention, have been told not to discuss climate change. âIt appears the problem has been swept under the rug,â says Mills, who headed the Maine CDC from 1996 to 2011. In the 2000s, she sat on a government task force charged with developing plans to respond to climate change; those efforts evidently went for naught. In an emailed statement, LePageâs office denied that the governor has ignored climate change. It cited his creation of a voluntary, interagency work group on climate adaptation in 2013, which includes the Maine CDC. âTo assume â¦ that the governor has issued a blanket ban on doing anything related to climate change is erroneous,â the statement said. A recent inventory of state climate activities performed by the group, however, shows that most of the health departmentâs work originated with the previous administration. This matters because public-health departments cannot contain an epidemic worsened by global warming if they pay no attention to the climate link. The Maine CDC had an ambitious strategy that would have helped it get ahead of the problem, experts say. That strategy hinged on forecasting how impending changes in Maineâs climate could increase tick-infection risks, enabling officials to warn people about where vector-borne illnesses were headed next and develop plans of attack. But the state has failed to follow through. Climateâs role in intensifying diseases carried by âvectorsâ â" organisms transmitting pathogens and parasites â" isnât as obvious as in heat-related conditions or pollen allergies. But it poses a grave threat. Of all infectious diseases, those caused by bites from ticks, mosquitoes and other cold-blooded insects are most climate-sensitive, scientists say. Even slight shifts in temperatures can alter their distribution patterns. In May, the U.S. Centers for Disease Control and Prevention reported a tripling of the number of disease cases resulting from mosquito, tick and flea bites nationally over 13 years â" from 27,388 cases in 2004 to 96,075 in 2016. Cases of tick-related illnesses doubled in this period, accounting for 77 percent of all vector-borne diseases. CDC officials, not mentioning the words âclimate change,â attributed this spike partly to rising temperatures. Officials like LePage are one reason the government response to the human impacts of climate change has been so sluggish. But discord within the health community has stymied action, too, according to interviews with more than 50 public-health experts and advocates, and a review of dozens of scientific studies and government reports. State and local health department employees may believe climate change is happening but donât necessarily see it as a public-health crisis, surveys show. Many find it too taxing or nebulous a problem to tackle. âLike most health departments, we are underfunded and our list of responsibilities grows ea ch year,â wrote one investigator from Arizona, echoing the 23 professionals who responded to a Center for Public Integrity online questionnaire. The fraught politics of climate change also loom. Chelsea Gridley-Smith, a senior program analyst for environmental health at the National Association of City and County Health Officials, says many local health departments face political pressures. Some encounter official or perceived bans on the term âclimate change.â Others struggle to convey the urgency of threats when their peers donât recognize a crisis. This reality is striking in Maine, among 16 states and two cities receiving a federal grant meant to bolster health departmentsâ responses to climate-related risks. Under the program â" known as Building Resilience Against Climate Effects, or BRACE â" federal CDC employees help their state and local counterparts use climate data and modeling research to identify health hazards and create prevention strategies. National leaders have praised the Maine CDCâs BRACE work, which includes Lyme disease. In 2016, Cooper Leonard, who lives just north of Bangor, developed a rash and tested positive for Lyme disease. The boy, then 7, could barely walk during his treatment with an tibiotics, his mother said. 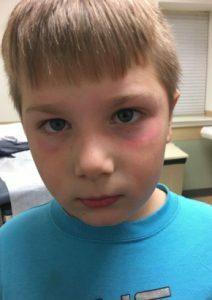 In 2016, her son Cooper, then 7, tested positive for Lyme disease aft er developing what she now identifies as an expanding or âdisseminatedâ rash, a classic symptom. Red blotches appeared on his cheeks, as if he were sunburned. The blotches coincided with other ailments â" malaise, nausea. Weeks later, they circled his eyes. The ring-shaped rash spread from his face to his back, stomach and wrists. The official count, driven by laboratory tests, underplays the public-health problem, experts say. In some states, Lyme has become so prevalent that health departments no longer require blood tests to confirm early diagnosis. The testing process â" which measures an immune response against the Lyme-causing bacteria â" has limitations as well. It misses patients who donât have such a reaction. Those who show symptoms associated with a later stage â" neurological issues, arthritis â" can face inaccurate results. The CDC estimates the actual caseload could be 10 times higher than reported. Dr. Saul Hymes heads a pediatric tick-borne disease center at Stony Brook University on Long Island, a Lyme epicenter since the diseaseâs discovery in 1975. Heâs noticed a change: Patients file into his office as early as March and as late as November. Often they appear in winter. Deer-tick samples collected from 2006 to 2011 at the universityâs Lyme lab show a jump in tick ac tivity in December and January. 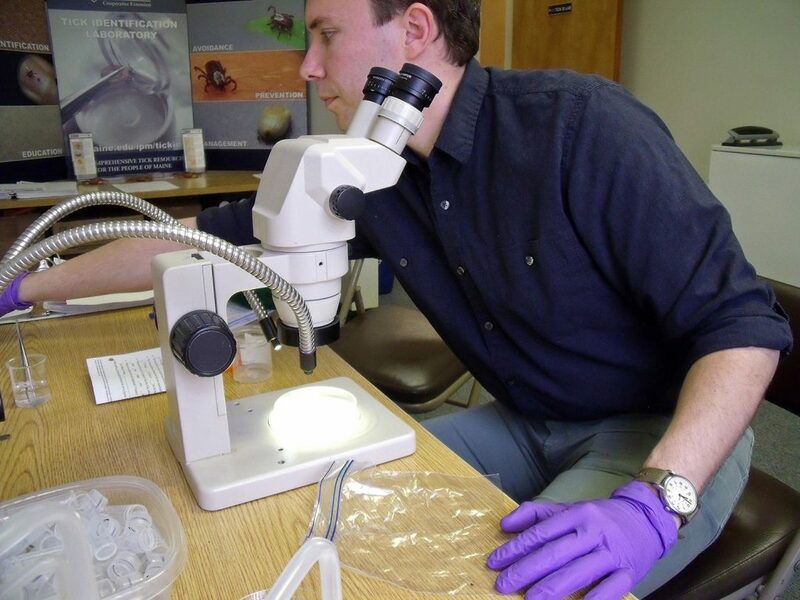 Today, the Maine Center for Disease Controlâs climate and health program amounts to little more than a half-dozen initiatives on ticks and tick-borne diseases. States where Lyme hardly existed 20 years ago are experiencing dramatic changes. In Minnesota, deer ticks and the illnesses they cause appeared in a few southeastern counties in the 1990s. But the tick has spread northward, bringing disease-causing bacteria with it. Now, in newly infested areas, says David Neitzel of the Minnesota Department of Healthâs vector-borne disease unit, âWe havenât been able to find any clean ticks. Theyâre all infected.â Minnesota ranks among the nationâs top five states for Lyme cases; it places even higher in incidence of anaplasmosis and babesiosis. A similar transformation is under way in Maine, where the 2017 count of 1,7 69 Lyme cases represented a 19 percent increase over the previous year. Anaplasmosis cases soared 78 percent during that period, babesiosis 42 percent. âItâs quite a remarkable change in a relatively short period,â says Dr. Robert Smith, director of infectious diseases at Maine Medical Center in Portland. Researchers at the hospitalâs vector-borne disease laboratory have tracked the deer tickâs march across all 16 of Maineâs counties since 1988. Through testing theyâve identified five of the seven pathogens carried by deer ticks. Thatâs five new maladies, some life-threatening. Lisa Jordan, a patient advocate who lives in Brewer, says sheâs already inundated with phone calls from people stricken by Lyme. On her cul-de-sac, she counts 15 out of 20 households touched by the disease. Three of her family members, herself included, are among them. âItâs a huge epidemic,â she says. T he link between Lyme disease and climate change isnât as direct as with other vector-borne diseases. Unlike mosquitoes, which live for a season and fly everywhere, deer ticks have a two-year life cycle and rely on animals for transport. That makes their hosts key drivers of disease. Young ticks feed on mice, squirrels and birds, yet adults need deer â" some suggest 12 per square mile â" to sustain a population. Rebecca Eisen, a federal CDC biologist who has studied climateâs influence on Lyme, notes that deer ticks dominated the East Coast until the 1800s, when forests gave way to fields. The transition nearly wiped out the tick, which thrives in the leaf litter of oaks and maples. The spread of the deer tick since federal Lyme data collection began in the 1990s can be traced in part to a decline in agriculture that has brought back forests while suburbia has sprawled to the woodsâ  edges, creating the perfect habitat for tick hosts. Eisen suspects this changing land-use pattern is behind Lymeâs spread in mid-Atlantic states like Pennsylvania, where the incidence rate has more than tripled since 2010. âIt hasnât gotten much warmer there,â she says. But climate is playing a role. Ben Beard, deputy director of the federal CDCâs climate and health program, says warming is the prime culprit in Lymeâs movement north. The CDCâs research suggests the deer tick, sensitive to temperature and humidity, is moving farther into arctic latitudes as warm months grow hotter and longer. 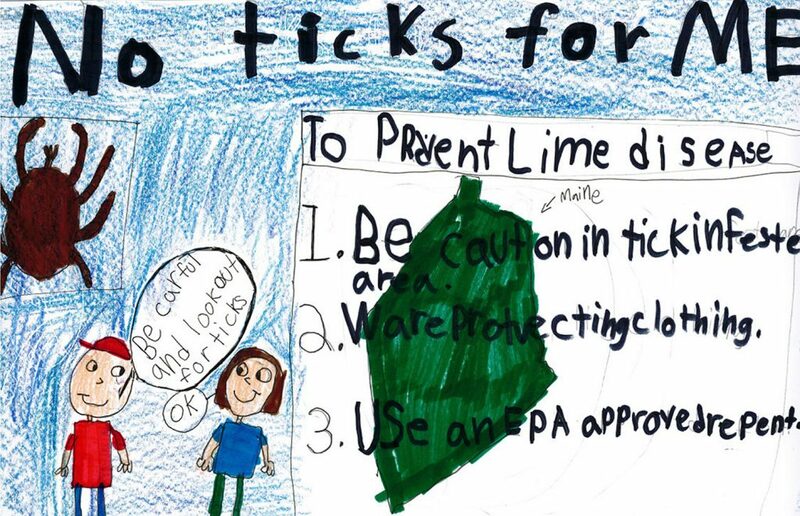 Rising temperatures affect tick activity, pushing the Lyme season beyond its summer onset. Scientists say ticks can use snow as a blanket to survive cold temperatures, but long winters will limit the deer tick, preventing it from feeding on hosts and developing into adults. In the 2000s, Ogden and colleagues calculated a threshold temperature at which it could withstand Canadaâs winter. They surmised that every day above freezing â" measured in âdegree days,â a tally of cumulative heat â" would speed up its life cycle, allowing it to reproduce and survive. They mapped their theory: As temperatures rose, deer ticks moved in. The Canadian health agency reports a sevenfold spike in Lyme cases since 2009. âWe know itâs associated with a warming climate,â Ogden says. The U.S. Environmental Protection Agency concluded as much in 2014, when it named Lyme disease an official âindicatorâ of climate change â" one of two vector infections to receive the distinction. In its description, the EPA singles out the caseloads of four northern states, including Maine, where Lyme has become most common. Maine researchers have found a strong correlation between tick activity and milder winters. According to their projections, warming in Maineâs six northernmost counties â" which collectively could gain up to 650 more days above freezing each year by 2050 â" will make them just as hospitable to deer ticks as the rest of the state. Research like this is crucial, experts say. Yet the federal government has failed to prioritize it. From 2012 to 2016, the Nat ional Institutes of Health spent a combined $32 million on its principal program on climate change â" 0.1 percent of its $128 billion budget, says Kristie Ebi, a University of Washington public health professor. NIH spending has gone up in the past two fiscal years, to an average of $193 million annually. But thatâs still less than the $200 million Ebi says health officials need annually to create programs that will protect Americans. And NIH spent 38 times as much on cancer research during the two-year period. Congress has done little to fix the problem. Last year, U.S. Rep. Matt Cartwright, a Democrat from Pennsylvania, sponsored legislation calling for an increase in federal funding for climate and health research and mandating the development of a national plan that would help state and local health departments. The bill, sponsored by 39 House Democrats, is languishing in committee. It has little chance of advancing as long as Republicans hold a majority. The on ly federal support for state and city health officials on climate change is the CDCâs BRACE grant program. George Luber, chief of the CDCâs climate and health program, considers it âcutting-edge thinking for public health.â He intends to expand it to all 50 states, but funding constraints have kept him from doing so. Republicans in Congress have tried repeatedly to excise BRACEâs $10 million budget, to no avail. Its average annual award for health departments has remained around $200,000 for nearly a decade. The modest federal response has shifted the burden to state and local health departments, most of which have âlimited awareness of climate change as a public health issue,â according to a 2014 Government Accountability Office report. Of the two dozen responding to the Centerâs questionnaire, only one said her agency had trained staff on climate-related risks and drafted an adaptation plan. In contrast, BRACE states are hailed as national mode ls for climate-health adaptation. In Minnesota, New Hampshire, Rhode Island and Vermont â" where deer ticks and their diseases are moving north â" health officials have modeled future climate change and begun education campaigns in areas where Lyme is expected to rise. Mills, the former Maine CDC chief, oversaw the departmentâs bid for a BRACE grant in 2010. State epidemiologists already were surveying tick-related illnesses, but no one was asking why deer ticks were spreading and which areas were in jeopardy. One year later, the department launched a program prioritizing vector-borne disease and extreme heat. Some employees worked with experts to model high-heat days and analyze their relationship with heat-induced hospital visits, among other activities. Much of the funding went to climate scientists and vector ecologists, who looked at the relationship between deer ticks and warming temperatures and d id a similar study involving mosquitoes. They planned to develop a broader tick model that would examine the climate and ecological processes underlying the spread of Lyme disease in Maine and project its future burden. By 2013, the administration of LePage, elected in 2010 as a denier of what he called âthe Al Gore scienceâ on climate change, was clamping down. Norman Anderson worked at the Maine CDC for five years and managed its climate and health program. He recalls department public relations officials warning him not to talk about his work and refusing to green-light his appearances. Eventually the governor eliminated the departmentâs climate-change research. Scientists say they had to replace their ambitious modeling plan with rudimentary activities and spend their remaining BRACE funds on âtick kitsâ â" complete with beakers of deer ticks in nymph and adult stages â" to distribute to schoolchildren. LePageâs office defended the governorâs decision, arguing that scientists studying the relationship between climate and disease âare best funded in research settings such as large universities,â not the Maine CDC. LePage did approve a proposal by the Maine CDC to renew its BRACE grant but only after narrowing the scope. Employees had to abandon planned climate research related to the health impacts of extreme weather and worsening pollen, records show. Their heat research yielded results â" indeed, the threshold at which officials issue dangerous heat advisories was lowered from 105 to 95 degrees Fahrenheit after their analysis had found it didnât protect Mainersâ health. But employees had to scrap their heat-response plans nonetheless. The only BRACE work that LePage approved involved Lyme prevention. In 2014, Anderson, frustrated by what he calls the ârepressiveâ environment, quit the Maine CDC. The departmentâs larger âstrategy around climate and health had just been whittled away,â he says. Today, the Maine CDCâs climate and health program amounts to little more than a half-dozen initiatives on ticks and tick-borne diseases. Health officials have developed voluntary school curriculums and online campaigns targeting the elderly, for instance. Theyâve launched training videos for school nurses and librarians. The departmentâs âmain prevention message is encouraging Maine residents and visitors to use personal protective measures to prevent tick exposures,â it said in a 2018 report. That report, filed by the Maine CDC with s tate legislators, hints at the departmentâs myopic focus on the accelerating public-health problem. Its vector-borne disease work group, consisting of scientists, pest-control operators and patient advocates, has extensive knowledge on ticks and tick-borne diseases, yet has no mandate to draft a statewide response plan, members say. Its published materials make no mention of Lymeâs connection to climate change. Former state officials say the prevention work is the best it can do with limited resources. At $215,000 a year, the BRACE grant â" which totals $1.1 million over five years â" isnât enough to cover a 38,385-square-mile state with 1.3 million residents, they say. No state money is directed toward the surge in tick-related illnesses. LePageâs office cites the governorâs leadership in building an $8 million research facility at the University of Maine, which opened last month. The laboratory â" the product of a ballot initiative in 2014 â" houses the universityâs tick-identification program. Director Griffin Dill considers it a major upgrade from the converted office in which he logged tick samples for five years. It will enable him to expand tick surveillance and test ticks for pathogens. Still, heâs candid about the bigger picture. Already, another threat is looming. Scientists consider the lone star tick a better signal of climate change than its blacklegged counterpart â" it has long thrived in southern states like Texas and Florida but is advancing northward. In Maine, tick ecologists have logged samples of the lone star species since 2013. Dill has surveyed fields and yards in search of settled populations, dragging what looks like a white flag on a stick over brush. He says the tick isnât surviving Maineâs winters â" yet. It may be bringing new and unusual diseases here nevert heless. Patty OâBrien Carrier suffered what she describes as a bizarre reaction â" itchy hives, a reddened face, a swollen throat â" twice before learning that she has Alpha Gal Syndrome, a rare allergy to meat. 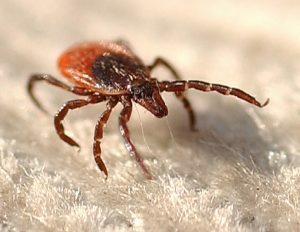 In February, lab tests identified its source: a lone star tick bite. A âferocious gardenerâ from Harpswell, OâBrien Carrier, 71, believes she was bitten in her yard. She spends her time in the dirt surrounded by roses, daisies and other perennials. She notices more ticks in her garden, she says, much like she notices the ground thawing earlier each spring. Now OâBrien Carrier performs the same ritual every time she goes outside: She applies tick repellent on her clothes and skin. She fashions elastic around her pants, and pulls her knee socks up. She adds boots, gloves and a hat. The Center for Public Integrity is a nonprofit investigative news organization based in Washington, D.C.